This pouncing fox is the third stone sculpture I made. I bought the stone at the stone carving class I took at the Loveland Museum in January, 2006. 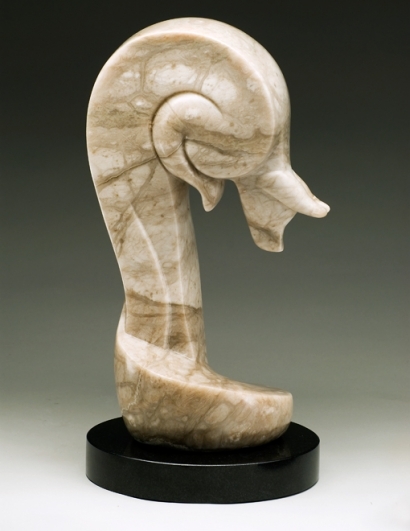 I didn’t know at the time, but this is a rare piece of Colorado Alabaster with the colors unmixed. I have not seen another piece like it. The pose came from an experience I had in college when I was walking the back way to campus down a road flanked by overgrown fields. In the field was a gray fox hunting in the tall weeds. He leapt high in the air and came straight down, almost lost in the vegetation. He then sprang up and came straight down again. I had never seen this before, and the sight stayed with me, finding expression in this sculpture.